Apr. 2 (NBD) – In China people use the term "brainwashing magic songs" to describe the catchy music that come about regularly. You hear them played by elders to accompany their dances in public spaces, and you hear them in viral short videos on TikTok and Kuaishou. But how are the infectious songs created, and who made them? On March 20, on the 22th floor of a building in the CBD of Beijing, self-media account Ciweigongshe met Song Mengjun, owner of a music company that mass produces earworms like products coming out from an assembly line. The day before, the company's monitor system detected that "More than Blue" are frequently searched on the popular music site KuGou. The key words were the name of a teen movie that hit the big screen recently and sparked widespread discussion on social media. People were hoping to find namesake songs after watching the movie, but there was none. Song's company, however, is good at meeting unsatisfied musical needs. And by midnight the song "More than Blue" was released on several music platforms. The whole process of capturing the hot topic, creating rhymes and lyrics, recording and going online took only one day. In similar fashion, his company has created many "fast consumer goods" of music that became hits on social media and music sites. "You can't quantify how good a song is, but you can see the data," says Song. "In 2018 on Kugou alone, my own works reached 920 million plays and 8.08 million downloads. If downloading a song charges 2 yuan (0.3 U.S. dollars), my music last year have created 16 million yuan (2.4 million U.S. dollars) in revenue." And he is not the only person making money. 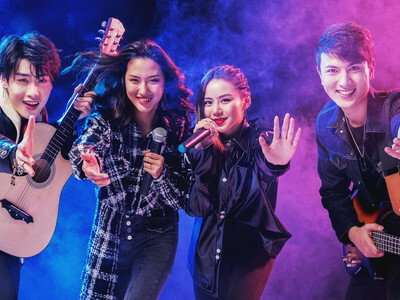 Successful musicians signed by his company can earn as much as 100,000 yuan (14889.6 U.S. dollars) in a month, whereas 95 percent of Chinese musicians cannot support themselves by music alone, according to an industry report. In many ways, those signed musicians are not dissimilar from employees in Internet companies. They not only need to compose and perform songs, but also study the market trends from an operational perspective. All important musicians are required to sit in the office every day. On one whiteboard the company specifically sets the working hours and lunch time. Besides conventional composing methods, Song's company adopted a "BEAT" method, which means finding a suitable beat first, then create new rhymes on the basis of it. At the end of 2018, a viral song "Waiting in the Subway" was collectively boycotted by a group of musicians, who accused that Song's music was patchwork based on already existing beats and sounds highly similar. People started calling his works "plagiarism" and him a "tailor of music". "Now there are many ways to write a song," responded Song, "and people have a self-righteous definition of plagiarism when actually it is a clearly defined legal matter." Song is a professionally trained musician who graduated from the prestigious Xinghai Conservatory of Music. At first he wanted to make "high quality" music like those of R&B super stars Leehom Wang and David Tao. However, his first album, released in 2010, hardly made any impact. One day he noticed that the plays of his songs reached a peak every Friday, and later he learned that most of his listeners are pupils, who only had enough spare time on Fridays. Song started studying the preferences of primary school students, and even lived with one of them. The result is a song named "Wangzhe Rongyao", the same as the popular smartphone MOBA game the piece was about, and it hit over 100 million plays in 2017. Song called his approach "Internet music C2B (consumer-to-business)", meaning that music production starts from the needs and preferences of users. "90 percent of users listen to music simply for the fun of it, and they don't care a bit whether the song is critically acclaimed." So Song believed and acted accordingly.